The Scripts Manager dialog allows you to create buttons in the Scripting toolbar. Each button you create can run a specific function in one of your scripts. You can also choose an icon and a tool tip for the button, if you want. NOTEFor tasks related to this dialog box, see Adding Scripts as Toolbar Buttons. In the Scripting toolbar, click on the Manage Scripts button. The Scripts Manager dialog box opens. A list of the available functions for the selected script. 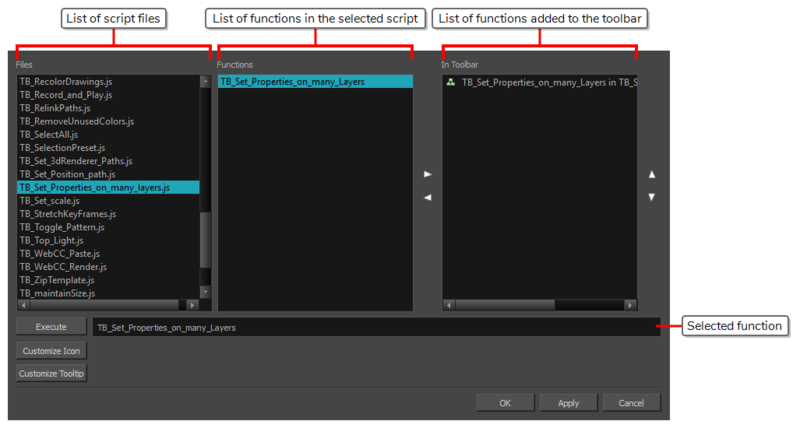 The list of script functions already added to the Scripting toolbar. TIPPress Esc to interrupt the execution of the script. Allows you to select an icon for the toolbar button. Clicking on this button will open an Open dialog prompting you to browse for and select a .png, .jpg, .xpm or .svg file. Allows you to type in a custom tooltip for the toolbar button.